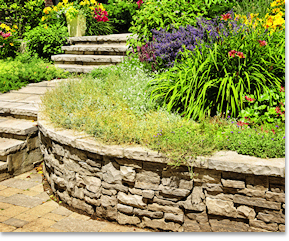 Colonial Landscape, Inc. has been serving the Lehigh Valley since 1979 with our landscape/hardscape design and installation. We have also grown into a full service nursery and landscape supply company. We offer an excellent selection of trees, shrubs and perennials. Specializing in dwarf and unusual trees and shrubs. A wide variety of landscape products are also available including only the finest bagged and bulk mulch, decorative stone, topsoil and sand. We enjoy serving Catasauqua, Whitehall, Northampton, Allentown, Bethlehem and the surrounding communities. Prompt delivery is available at very reasonable prices. Please call 610-266-9010 or stop by and visit our 3 acre property today.